Priyanka Gandhi will be accompanied by Jyotiraditya Scindia, the party's western Uttar Pradesh in-charge, and her brother Rahul on the occasion. 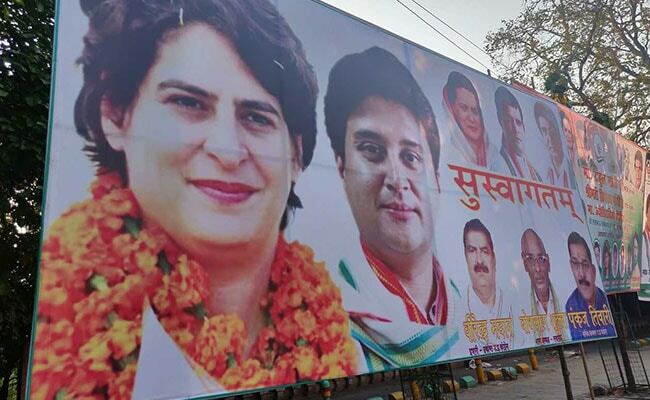 Priyanka Gandhi will be accompanied by Jyotiraditya Scindia and Rahul Gandhi. Priyanka Gandhi Vadra, who is being hailed by many as the Congress' big hope in the make-or- break state of Uttar Pradesh ahead of the Lok Sabha polls, will finally arrive in Lucknow this morning. Rahul Gandhi, brother and Congress president, had announced her entry into politics as the party's general secretary in-charge of eastern Uttar Pradesh two weeks ago. Priyanka Gandhi will be accompanied by Jyotiraditya Scindia, the party's western Uttar Pradesh in-charge, and the Congress chief on the occasion. "Tomorrow, I hope that we can all come together to bring about a new kind of politics. A kind of politics in which all of you will be stakeholders. A kind of politics in which the voice of my youth friends, my sisters and the poorest of the poor will be heard," she told supporters through the party's Shakti App on Sunday. The Congress has drawn up grand plans to publicise Priyanka Gandhi's Lucknow visit. From Lucknow airport, all three leaders will proceed to the city's Congress office in a roadshow running well over 30 kilometres through some of the most congested areas of the city - garlanding statues of Mahatma Gandhi and BR Ambedkar along the way. Congress leaders and workers will gather to welcome her and the others at 14 different points on the route, and party workers from neighbouring districts have been called in to ensure good public presence. After reaching the Congress office, Priyanka Gandhi and the other leaders are expected to address a press conference and inaugurate a new media centre. But while the Congress believes that Priyanka Gandhi's entry will boost its prospects in the Lok Sabha elections, with her charisma and voter connect being touted as the major draws, a reality check suggests that it could still be a daunting task. The last two Lok Sabha elections in eastern UP - the Gorakhpur and Phulpur bypolls of 2018 - turned out to be disastrous for the party. On both seats, its candidates managed only about 19,000 votes each and a 2% vote share in each constituency. The 2014 Lok Sabha polls was just as tragic for the Congress, bagging just two seats - Amethi and Raebareli - as compared to the 21 it had won five years earlier. The party's vote share also dropped by almost 50% between 2009 and 2014. So, the question is: Does Priyanka Gandhi have the time to revive the party's seemingly defunct grassroots organisation? Sources say the party decided on Priyanka Gandhi's foray into eastern Uttar Pradesh after much thought, and the leadership believes that reviving it in eastern Uttar Pradesh would amount to achieving a symbolic victory. Allahabad (or Prayagraj, as it is called now) was Lal Bahadur Shastri's Lok Sabha seat and home to the Nehru family. Neighbouring Phulpur was Jawaharlal Nehru's Lok Sabha seat. East Uttar Pradesh also has the strongholds of both Uttar Pradesh Chief Minister Yogi Adityanath and Prime Minister Narendra Modi, and a good showing in a direct fight can boost the party's morale immensely. Failure is a possibility too, but that's a chance Priyanka Gandhi and her brother are willing to take.